Lego DC Super-Villains is a Lego-themed action-adventure video game developed by Traveller's Tales, which serves as a spin-off to the Lego Batman trilogy and the fourth instalment in the Lego DC franchise. 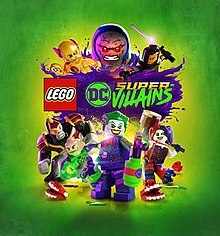 Unlike the Lego Batman trilogy, this is the first Lego video game to focus entirely on villains of the DC Universe, similar to the villain levels featured in Lego Batman: The Videogame. The game was released by Warner Bros. Interactive Entertainment on 16 October 2018 in North America and 19 October worldwide. Cover art for Lego DC Super-Villains. With the core gameplay following the same style of past Lego titles, the game features a customised character in the game's story. The game also features a two-player cooperative multiplayer mode. The game's storyline centers around villains from the DC Universe as they battle against a group of superheroes from another universe. Lego DC Super-Villains is an action-adventure game played from a third-person perspective, alternating between various action-adventure sequences and puzzle-solving scenarios. The game itself operates with the same level of gameplay mechanics from Lego video games, as well as elements from the Lego Batman Trilogy, focusing on a mixture of levels consisting of two modes - story and free roam - along with open-world elements in between levels, featuring a selection of locations from the DC Universe, including condensed versions of Gotham and Metropolis. Like previous titles from the Lego Batman Trilogy, such as Lego Batman 2: DC Super Heroes & Lego Batman 3: Beyond Gotham, players gain access to a roster of iconic and obscure characters from the DC Universe, each with their own unique abilities. Lego DC Super-Villains stands out from other Lego video games by being the first to incorporate the use of a custom character, who becomes integrated with the game's story. Initially players devise their looks, name, and style of fighting, but gain access to super-powers for their character to use as they progress in the story, along with unlocking customisation options. Design of these elements were mainly influenced from Ubisoft's South Park video games, The Stick of Truth and The Fractured but Whole. The game features a Deluxe Edition, which grants players who purchase it access to two character packs for the game - "DC Super-Villains: TV Series DLC Character Pack" and the "Justice League Dark DLC Character Pack". In addition, a season pass can be also purchased, which consists of levels based on other DC media franchises - two based on the 2018 film Aquaman, one based on the animated film Batman: Mask of the Phantasm, two based on the 2019 film Shazam!, and one based on the animated series Young Justice. Other character packs were also created, including "DC Super Heroes: TV Series DLC Character Pack" - a pack consisting of characters from The CW DC programs The Flash, Arrow, Supergirl, Legends of Tomorrow and Black Lightning - and "DC Films" - a pack consisting of characters from the DC Extended Universe. Following the recent capture of an individual (dubbed "The Rookie") who had broken into the laboratory of Professor Ivo, Commissioner Gordon oversees their transfer to Stryker's Island in Metropolis. Enlisting the aid of the incarcerated Lex Luthor, Gordon reveals that the Rookie gained the ability to absorb superpowers, based on the secret Amazo Project, and offers Luthor a reduction in his prison sentence in exchange for monitoring the new villain's powers. Before Luthor agrees, his personal bodyguard Mercy Graves arrives and helps to break him and the Rookie out, alongside a number of other villains in the prison including Cheetah, Solomon Grundy, and Metallo. As they prepare to make their escape, the Justice League arrives to intercept them. Meanwhile, The Joker and Harley Quinn break in to Wayne Tech, stealing several items including a mysterious box, but are forced to escape from Batman. Reunited with Luthor's band of villains, the group find themselves defeated by another superhero team from a parallel Earth, called the "Justice Syndicate" as the Rookie and Cheetah escape. Following their swift victory, the Syndicate promptly warp the Justice League away, which Harley witnesses before being forced to escape with Luthor and Joker. Shortly afterwards, the Syndicate proclaim themselves as the League's replacements from Earth-Three, standing in for them while their counterparts are claimed to be off-world on a secret mission. In the meantime, Luthor takes the Rookie under his wing to recruit villains under the Legion of Doom, while Joker leads Gotham's criminals such as Scarecrow, Clayface, and Riddler, on a raid of the GCPD HQ, contending with Nightwing and Batgirl. During their escape after the raid, Harley is accidentally lost, while the group encounters Catwoman, Penguin, and Two-Face. The group discovers Batman's counterpart, Owlman, acts differently for a superhero. Luthor and the villains reunite at the Hall of Doom and begin to suspect the Syndicate is not what they claim to be, prompting Catwoman and a small group of the Legion to find Harley, the only one who witnessed who they really were. Meanwhile, The Rookie, Captain Cold, Reverse-Flash, Heat Wave, and Merlyn seek out The Flash's Cosmic Treadmill at S.T.A.R. Labs in order to visit the Syndicate's world, eventually discovering that they are actually the Crime Syndicate - a team of villainous counterparts of the Justice League. After their discovery, the villians run into Killer Frost and Mirror Master and are suddenly attacked by the Teen Titans. The villains overpower the Titans until the Syndicate's Johnny Quick, Deathstorm, and Atomica rescue the Titans and defeat the villains. Killer Frost and the Rookie manage to escape and return to the Legion of Doom, while the other villains are apprehended by the Syndicate. Upon their return, the villains recruit Captain Boomerang and Deadshot to help them find Harley Quinn, after breaking them out of Belle Reve. Without the evidence Harley had made of the Syndicate's true nature, the Legion opt to meet Clark Kent's replacement at the Daily Planet, Kent Clarkson, for help in exposing the group. Unaware that Clarkson is the alter ego of Superman's villainous counterpart, Ultraman, the villains inadvertently give the Syndicate the means to discredit Harley's eyewitness account. After Luthor helps to rescue Joker and many other inmates, including Livewire from Arkham Asylum, he reveals that he had been spying on the Syndicate's activities. Learning that they are searching for something on Earth, using their role as superheroes to gain free access to every lab and military base on the planet, Luthor reveals the object being sought after could spell doom for Earth and themselves. Deciding to take up the job of saving the Earth in the League's absence, Luthor begins a hunt for more powerful villains for the Legion, recruiting Gorilla Grodd, Sinestro, and Black Adam. The Syndicate's Sea King attempts to put a stop to them by attacking the Hall of Doom with a giant squid but is defeated by Black Manta, King Shark, and Poison Ivy. After Sea King's defeat, the villains regroup and launch an attack on the Crime Syndicate on top of LexCorp. Luthor, who is wearing a suit that mimics Superman's powers, suddenly betrays everyone and plans to use the Syndicate's technology to be rid of them all in order to rule the Earth alone. However, the Rookie tries to stop him, and, while Luthor succeeds in teleporting everyone away, he also ends up bringing Apokolips right next to Earth. As the Syndicate tries to keep Earth's people calm, Joker, Harley and the Rookie wake up on Apokolips and find themselves encountering Darkseid, the Syndicate's secret master, who ordered them to search Earth for the last piece of the Anti-Life Equation. As Darkseid discovers them, the Justice League show up, aided by John Stewart and the Green Lantern Corps. As they start fighting Darkseid's forces, the League and the trio of villains escape, but lose Superman in the process. The Syndicate tries to trick the people of Earth that the League became villains, thus prompting the League to form an alliance with the Legion of Doom to expose them and stop Darkseid. However, they first need to recover Superman and recruit several additional allies for their upcoming fight against Darkseid's forces: Wonder Woman, Cyborg and Harley travel to Themyscira and recruit the Amazons, after freeing them from Granny Goodness and Virman Vundabar's mind-control; Batman, Flash and Joker travel to Nanda Parbat and recruit Deathstroke and the League of Shadows, led by Ra's Al Ghul; and Green Lantern, Aquaman and the Rookie arrive on Dinosaur Island and recover Superman, after saving him from Kalibak. After Flash and Reverse-Flash defeat Johnny Quick, they force him to confess what the Syndicate's true intentions are. Lois Lane, who has been investigating the Syndicate since the beginning, films everything, thus allowing the alliance to expose the Syndicate for who they really are. Upon defeating and sending the Syndicate back to Earth-Three, the alliance focus on finding the last piece of the Equation. Batman soon discovers it to have been inside a Mother Box that Harley kept with her all along, until the Rookie inadvertently absorbed it while sending the Crime Syndicate back to their Earth. Learning that Darkseid is sending his forces to Earth to track it down, Batman orders the alliance to protect the Rookie. Despite their best efforts, Darkseid's general, Steppenwolf, captures the Rookie and takes them to Apokolips. Reunited with Luthor, the League and the Legion invade the planet. Successfully rescuing the Rookie, the alliance defeats Darkseid, whom the Rookie then turns good using all their powers combined, along with his generals. The alliance then returns Apokolips back to its original place, despite Luthor attempting to abandon everyone again. Upon returning to Earth, the Rookie is given the choice of joining the League as a superhero, or continue working for the Legion as a supervillain, whereupon they leave with their respective decision. In a post-credits scene, a new enemy arrives on Apokolips and, disgusted by Darkseid's kindness, assaults him. In a series of five bonus levels, Lobo narrates the Justice League's adventures on Apokolips following their abduction there by the Crime Syndicate. It takes place at the same time as the main campaign. After escaping from their respective imprisonments, the League members fight their way through Darkseid's forces, including various members of his Elite, and try finding each other, before making their way together to Darkseid's palace to confront him, which eventually leads to their encounter with Joker, Harley and the Rookie in the main story of the game. The game was leaked by Walmart Canada in May 2018. Warner Bros. Interactive Entertainment announced the title officially on 30 May 2018. Game director Arthur Parsons revealed that the concept of a super villain themed game dates back in 2008's Lego Batman: The Videogame, with featured levels based on a villain's point of view of the story. The game's voice work is directed by Liam O'Brien, where this marks the first Lego game since Lego Dimensions to have original voice acting utilised by actors who are affiliated with the Screen Actors Guild‐American Federation of Television and Radio Artists (SAG-AFTRA) following the conclusion of the 2016–17 video game voice actor strike. Parsons has stated that the game utilises an "All-Star" voice cast, where he describes his excitement on the game's cast as the best one that he has ever worked on in any Lego game that the company has ever done. Like Lego Batman 3: Beyond Gotham, the cast consists of a number of various actors reprising roles from various DC properties. Noticeable additions to the game's cast includes of Michael Ironside reprising his role as Darkseid since the Justice League Unlimited series finale "Destroyer", for the first time since 2006, Zachary Levi reprising his role as Shazam from the Shazam! film to coincide the release the Shazam! DLC packs, and Greg Miller providing the voice of Polka-Dot Man. The game received "generally favorable" reviews for all platforms except for Xbox One, which received "mixed or average" reviews, according to Metacritic. ^ a b c Takahashi, Dean (30 May 2018). "Warner Bros. unveils TT Games' Lego DC Super-Villains". VentureBeat. Retrieved 1 June 2018. ^ a b McWhertor, Michael (30 May 2018). "New Lego game lets you team up with Joker, Harley Quinn and other DC bad guys". Polygon. Retrieved 1 June 2018. ^ LEGO DC Game (21 August 2018). "Official LEGO® DC Super-Villains Story Trailer". YouTube. ^ Totilo, Stephen (15 June 2018). "Lego DC Super-Villains' Custom Characters Have A Lot Of Potential". Kotaku. ^ Usher, William (24 August 2018). "New LEGO DC Super Villains Trailer Reveals Darkseid Is The Big Bad". CinemaBlend. ^ Crecente, Brian (30 May 2018). "'Lego DC Super-Villains' Drops in October". Variety. ^ Henry, Cole (30 May 2018). "See the LEGO DC Super Villains Announcement Trailer". Paste Magazine. Retrieved 1 June 2018. ^ a b JayShockblast (12 June 2018). "LEGO DC Super Villains - Arthur Parsons Interview with IGN at E3 2018: Character Creator Showcase!". YouTube. ^ Capel, Chris (21 August 2018). "LEGO DC Super-Villains Story Trailer Brings Back Classic Animated Series Voice Actors". Game Revolution. ^ Nieves, Davey (28 September 2018). "LEGO DC SUPER-VILLAINS Says Welcome To The Darkseid In A New Vignette". The Beat. ^ a b "LEGO DC Super-Villains Critic Reviews for PlayStation 4". Metacritic. CBS Interactive. Retrieved 23 October 2018. ^ a b "LEGO DC Super-Villains Critic Reviews for Nintendo Switch". Metacritic. CBS Interactive. Retrieved 24 October 2018. ^ Watts, Steve (5 July 2018). "Resident Evil 2 Wins Top Honor In E3 Game Critics Awards". GameSpot. Retrieved 5 January 2019. ^ Keane, Sean (22 August 2018). "Gamescom 2018 award winners include Marvel's Spider-Man, Super Smash Bros. Ultimate". CNET. Retrieved 5 January 2019. ^ Keyes, Rob (3 January 2019). "2018 New York Game Awards Nominees Revealed". Screen Rant. Retrieved 5 January 2019. ^ Makuch, Eddie (10 January 2019). "God Of War, Spider-Man Lead DICE Awards; Here's All The Nominees". GameSpot. Retrieved 13 January 2019. ^ "Nominee List for 2018". National Academy of Video Game Trade Reviewers. 11 February 2019. Retrieved 14 February 2019. ^ "Winner list for 2018: God of War breaks record". National Academy of Video Game Trade Reviewers. 13 March 2019. Retrieved 14 March 2019.